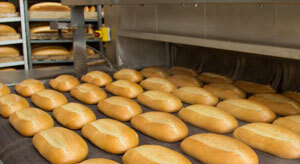 As a specialist in bread-making equipment and manufacturer of water chillers and water meters, SOREMA is continuously developing its temperature control solutions for artisan bread-making (water chillers, water meters, oven steam condensers) and industrial bread-making (water chillers, water meters, ice machines). SOREMA has developed a range of essential bread-making equipment for dough preparation, enabling the baker to control temperature for high-quality products. The SOREMA water chiller fits perfectly into the bakery above the mixing trough, using a wall bracket or a four-legged frame adjusted to the height of the mixing trough. Dough preparation is also optimised by the water meters designed by SOREMA: volume programming, temperature adjustment with mixture of hot water. The mixture in the trough is therefore perfect and consistent. Our expertise in bread-making equipment and refrigeration has also enabled us to develop electrical oven steam condensation solutions, facilitating oven installations even in premises where air exhaust systems would be impossible. The feedback we receive from bread-making professionals, users and installers drives us to constantly innovate and improve bread-making equipment for all types of bakery. SOREMA’s range of feedwater chillers can chill mains feedwater to +1°C. Depending on the model, it is possible to chill 30 to 2000 litres an hour to +1°C. An essential ergonomic and modular range for enhanced quality, precision and time-saving, with numerous optional extras. 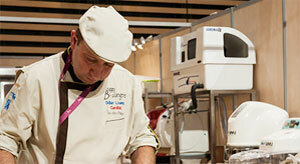 A range dedicated to industrial production for better management of dough temperature. non ut consectetur eleifend elementum libero porta.